Be located in New Jersey; be active within the year prior to their application submission date (information about additional related experience is welcome); and, agree to have their project shared with others through a written description to appear in the awards program, press materials and on the excellence awards website. Third-party nominations must be accompanied by a written authorization from the nominated party agreeing to consideration for the award. The DEP, other state agencies and state employees are ineligible for awards and cannot submit award applications. All applicants must address the following five judging criteria. The answer to each criterion may not exceed one typewritten page. Quantify the overall environmental benefits of this program/project or individual accomplishment during the past year or most recent 12-month period for which data exists. For example: amount of pollution prevented; resources or energy conserved; acres preserved; tonnage recycled; emissions reduced, etc. It is to the applicant’s benefit to be thorough. Inclusion of information or data from previous years is also welcome. Describe how this program/project or individual accomplishment contributes to the environmental needs of the state. Reference such issues as originality, effectiveness, risks that were overcome, how it reached audiences, and whether the project is a component of a larger comprehensive plan. Describe the long-term impacts of the program/project or individual accomplishments to the business, community, school or state. Describe how the project can be replicated in other locations or by other people. Describe how this program/project or individual accomplishment shows leadership and collaboration, and demonstrates how steps beyond “traditional” environmental protection efforts have been taken. Describe what education and/or outreach activities were undertaken in association with this program/project or individual accomplishments to reach or educate affected individuals, employees, students/faculty, stakeholders, contractors, consultants, community members, etc. Groups of reviewers comprised of professionals from the DEP will evaluate the applications. Each of the judging criteria has an associated point value identified in the section above. The total number of points possible for each application is 100. Applications will only be scored on the answers to the five judging criteria. A maximum of three additional pages of supporting materials such as articles, letters, diagrams, maps and photos will be accepted. Application and supporting materials cannot exceed nine pages. The DEP reserves the right not to give an award in any category if no outstanding nominations are received. All decisions of the judges are final. 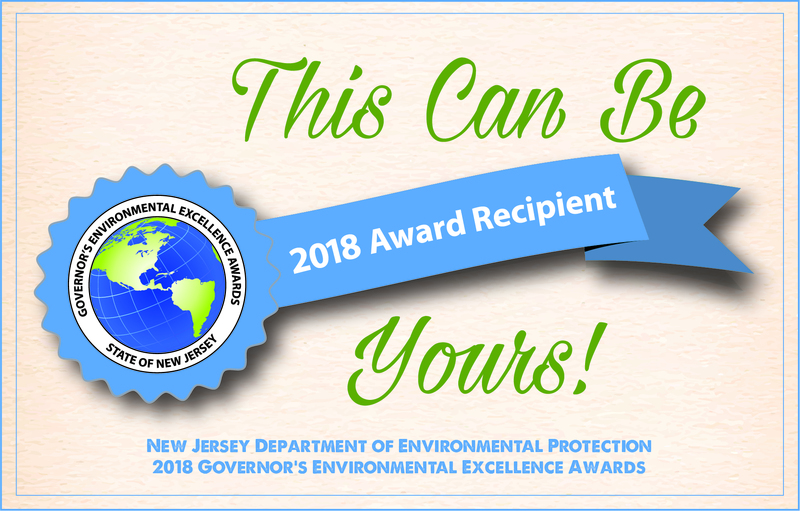 For questions about the application or awards program call Tanya Oznowich at (609) 984-9802 or email Tanya.Oznowich@dep.nj.gov. Applicants will be notified about award decisions in November or early December. The awards ceremony will be held in December in Trenton or elsewhere in Mercer County. One award will be presented in each of the categories listed below. You must identify the category of your nomination on the attached application form. Reducing air deposition loading to land and water. Promoting or developing land use policies, watershed management approaches and green infrastructure projects to improve protection of water sources or to reduce the impacts of flooding and sea level rise. HEALTHY ECOSYSTEMS AND HABITATS: Nominees in this category should demonstrate a commitment to and experience in programs or techniques that have resulted in the restoration, protection and enhancement of the state's ecological resources. These include wetlands, estuaries and coastal areas, as well as habitats (land and water-based) for non-game and/or threatened and endangered species. INNOVATIVE TECHNOLOGY: Nominees in this category should demonstrate the use or deployment of a new or alternative method, procedure, process, system or facility, which results in greater environmental protection than other technologies in current practice or comparable results at lower costs in terms of energy used, emissions reduced, natural resources restored, improved resiliency, or reduced environmental impacts. LAND CONSERVATION: Nominees in this category should demonstrate a commitment to and experience in the preservation of open space that protects land from future development and/or improves the resiliency of a municipality. Creation of community-based initiatives that foster involvement, action and effective solutions to the adverse effects of industrial pollution in overburdened and low-income communities. Municipalities participating in the Sustainable JerseyTM Program, should note this in their application. ENVIRONMENTAL EDUCATION / EDUCATOR-LED and STUDENT-LED PROJECTS: Nominees in these two categories should demonstrate implementation of a program or project that has measurable positive impacts in environmental protection and education and focuses on climate change or one of the seven categories above. One award will be given to an adult educator and one will be given to students/youth in grades K-12 (student involvement must be emphasized). Schools or districts participating in the Sustainable Jersey for SchoolsTM Program, Eco-Schools USA or the U.S. Green Ribbon Schools program should note this involvement in their application.